Having picky eaters help cook will make them more likely to try something they had a part in creating. Trying new recipes with the help of the kids will make it an exciting adventure for all of you, expanding creativity and imagination. Bringing home uncommon fruits and vegetables from the Farmers’ Market for the entire family to try, and discovering them for the first time, can become a fun experience in trying the foods together. If cooking some recipes (or cooking in general) is out of your comfort zone, honing a new skill together can become a memorable experience for you and your family. Even if the dish looks nothing like the picture on Pinterest! Trying new recipes with the help of the kids will make it an exciting adventure for all of you, expanding creativity and imagination. Cooking with young children helps to boost their self-confidence, even just by putting them in charge of simple kitchen tasks. Toddlers can help stir foods, spread butter or peanut butter, squeeze lemons and limes, wash produce, help with mashing, and “paint” oil on food before baking, broiling, or barbecuing. Having them set the table is also a great task that they will enjoy. These tasks help with developing fine motor skills in a fun and exciting way. 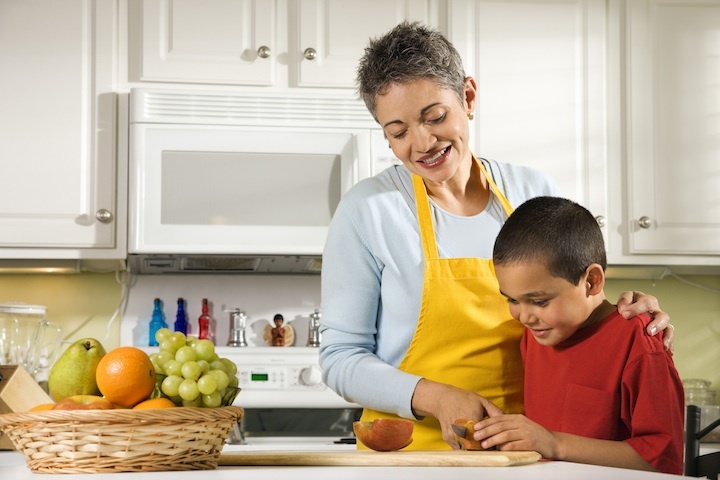 Older children can help with cutting with metal butter knives or plastic knives. They can help grate cheeses, begin measuring, and add spices. Many of the tasks they can carry out will help teach them fractions, sequencing, organization, problem solving, and even sharing. Cooking with the kids creates the perfect opportunity to talk about nutrition and the importance of eating a variety of food from all of the food groups. Explain the importance of a “colorful plate,” meaning that the different colors represent the different nutrients that we all need. This can challenge them to make a rainbow of colors out of the foods you prepare together. Showing your children how freshly cooked foods taste better and look better than processed, prepackaged food or restaurant foods, will have them craving them! Freshly baked sweet potatoes will be tastier and a more colorful than deep-fat fried potatoes from a fast food restaurant. With the many wonderful benefits and endless opportunities for you and your kids to cook together, why not start tonight and have many years of yummy enjoyment? There are many resources available online for easy recipes, great ideas, inspiration, and success stories! To get you started, check out Gallatin County WIC’s Easy & Healthy Recipes. For more information, check out Gallatin County WIC.